EYE4ADVENTURE: Up North Part 2 : Manganui a Te Au? After staying a few days in Palmerston north we headed north to National Park, catching up on Sheree & Jimmy and hoping for some Central Plateau action. 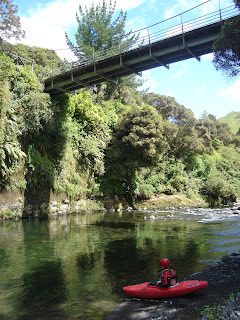 All the rivers were low so we headed to the Manganui which according to the guidebook was paddlable at any flow. We managed to rock dodge our way down through a scenic gorge and watch a couple of Whio (Blue Ducks) negotiate the same rapids as us. The run was interesting but with some more water would be a great trip. Short Class 2-3 rapids lead into large walls as the river turns sharp corners.